Much of the Geneva Motor Show happened while you were sleeping, which didn't stop us from covering it. Wondering what happened? Scroll down through this page or use this as your cheat sheet. Geneva's slowly morphed into a more important show for brands who want to show off their most expensive and exotic cars. While they might hold back in Frankfurt or Detroit, there's something about the Swiss show that allows designers to let loose. Maybe it's looking up at Mont Blanc. Maybe it's all the chocolate. Maybe it's just the proximity to all those Swiss bank accounts full of untaxed loot. Whatever the reason, here's what we've seen so far. This is in lieu of The Morning Shift, which returns later this week. Porsche dropped the manual transmission for a PDK, but it redlines at an Everest 9,000 RPM. Is it really a GT3, though? That's up for debate. Read more here. Yep, the Wraith is the most powerful Rolls-Royce ever. Here it is live. 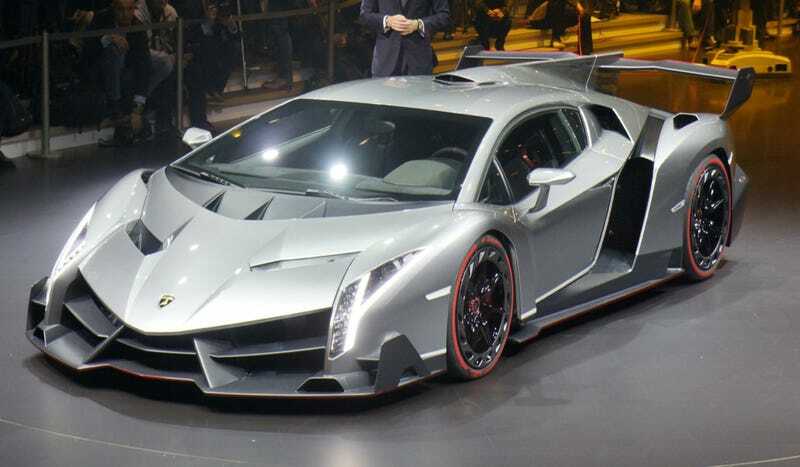 Absolutely the most batshit thing that debuted at Geneva was the Veneno. Here's all of it, here's video of it and here's why we love it. After years of teasing we finally get to see the 250-limited-run VW XL1. It's a two-seater diesel-electric hybrid that gets 260 MPG and looks great doing it. More here. This is our first chance to see the new, hatch BMW 3er in person. Actually, it looks great. Debate it here. Yes, it's the most exclusive Mercedes hatchback. And they had Usher debut it. Don't hate, "Climax" was a great jam. It's a wild name, yes, but it's also a wild car. Here's LeFerrari video, LeFerrari photos, and LeFerrari info.